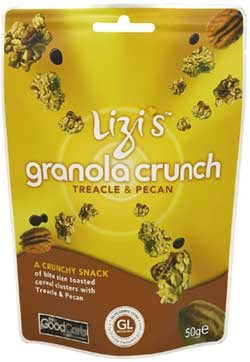 So, I recently found this delicious granola crunch snack/breakfast at Whole Foods in the raw food aisle. I decided to try it because I'm always craving toffee & nutty foods. On top of looking yummy, I noticed the package had a "Good Carb" label, and advertised that it was a low glycemic food (the glycemic level is only 6 grams although I don't know too much about that yet) which intrigued me since I find that lower carb and lower sugar foods usually leave me feeling much more full and satisfied than other foods. The granola is packed with fiber from Oligofructose syrup (a soluble prebiotic fiber that comes from chicory root), and it also has nuts, flaxseeds, and molasses in it. The taste is great -- a bit granola, a bit pecan, and a bit molasses which really hit the spot for me. So the nutritional information has some good news and bad news. The whole package is 270 calories, 17 grams of fat, and 10 grams of fiber, and 6 grams of protein. Pretty high! The good news is that the package contains 57 grams (2 ounces) of granola which is a *huge* portion (about two portions of most cereals). So, if you eat half the bag (which is a lot of granola) you'd be eating 135 calories, 8.5 grams of fat (healthy fat from nuts for the most part), and 5 grams of fiber -- or 2 weight watchers points. I personally don't like to eat a whole serving of most granolas all at once. My favorite thing to do with granola is to combine it with yogurt (like fage yogurt) and frozen cherries to create a yogurt sundae. Granola is also great to sprinkle on your ice cream, oatmeal, or your cereal as well (especially this one since it has such great taste). I hope you like this granola as much as I do. If you can't find it, you can also consider eating this other low calorie granola (which is also pretty good and extremely crunchy) from Enjoy Life. agree with you Juliet, granola is perfect combining it with yogurt and berries. I find them too sweet to eat it plain as cereal. I'll look for this next time in WF. But I think your WF has more goodies than mine because it's hard for me to find many things that you've reviewed. That looks really tasty! I'll have to try it! Our grocery store down here has a monopoly on things, so I hope I can find it! I recently purchased the Enjoy Life granola you mentioned a while back. I will have to look for this one as well. BTW, you stated that you weigh everything. Is there a particular kitchen scale that you feel is accurate and is user friendly? I wish I had this to snack on now! I usually avoid buying granola and make my own because of all the calories, sugar and butter in store bought, but this sounds great!